Robert G. Fowler/s flight from the Polo Fields to cross the country in 1911. Flying into SFO airport recently, I got a great view of the Bay Area as we banked to line up for the runway approach, and I began thinking about the role our peninsula has played in early aviation. With the centennial of the Panama Pacific International Exposition (PPIE), there has been interest about daredevil flyers like Art Smith, Lincoln Beachey, and the Loughead Brothers—who gave passenger rides at the fair, and used that income and a name change to become Lockheed Aircraft Company. 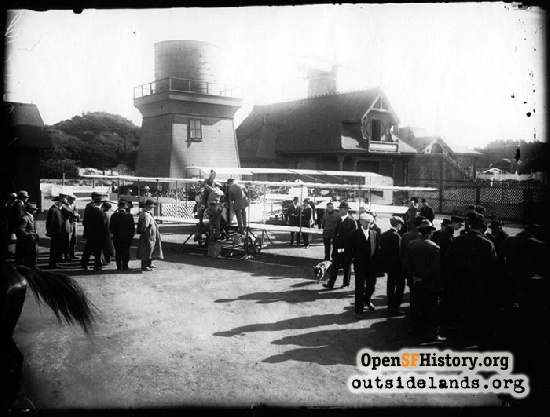 There is a rich history of aviation in the Bay Area, but the focus of this article is about a pioneer aviator whose remarkable exploits began with a flight out of San Francisco’s Outside Lands. Early aviation depended to a great extent on staying aloft by the aid of the wind. The westerly winds that came through the Golden Gate and across the hills of the San Francisco peninsula could be fairly reliable to provide the updrafts for early biplanes. Those early aeroplanes had evolved from gliders, but with an engine to boost the plane off the ground and soar to greater heights. One of the many technical problems aviation designers faced was creating a light enough engine that provided enough horsepower to lift their airplane off the ground and above the obstacles below them. In the Richmond District of San Francisco, the Gonzales twins, Arthur and Willie, were captivated by aviation. They lived at 435 16th Avenue, with their rear yard facing the great sand dunes where they experimented with flying kites in the strong westerly winds. 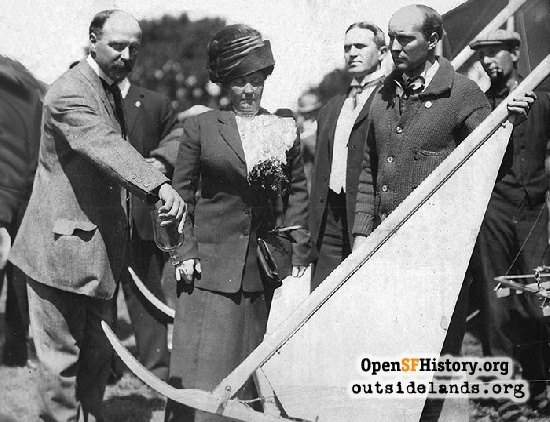 They graduated from kites to gliders and eventually to a motorized airplane by 1912. The strong winds, lack of obstructions, and soft landing in the sand were great aviation advantages for gliders. But that same soft sand would be a major obstacle to get lift-off for a heavier motorized plane. The Gonzales brothers were ambitious hobbyists, but had to earn a living with paying jobs. By 1918, the brothers had moved to Los Angeles and abandoned their lofty aviation pursuits. In the same early twentieth century aviation time frame, a San Francisco-born auto-racing daredevil who grew up in Gilroy was becoming intrigued by the same passion to fly as the Gonzales twins. Robert G. Fowler had engineering training and college time at the University of California, Berkeley, but left school to pursue auto racing on tracks in both Europe and the United States. He set a long-distance record, driving from Los Angeles to San Francisco in fourteen hours. In 1910, he got the chance to try one of the flying machines belonging to two racing friends. In the underpowered airship he never did much more than make brief hops across a field at forty miles per hour, but he was hooked to learn more and fly higher. In October of that same year, publisher William Randolph Hearst also was given a ride in one of those primitive aircrafts, and calculated that an air event in this new field of aviation would be a great scheme to sell more papers. Hearst put out a challenge of $50,000 to the first person who would fly one airplane across the United States in thirty days or less. The purse would be withdrawn if the feat was not accomplished by October 10, 1911. Fowler consulted the experts. The famous Wright brothers, credited with inventing and building the world’s first successful airplane, felt such a lengthy journey would exceed the limits of current aircraft technology. A four thousand mile “short-hopping” trip within a month was beyond the power limitation of motors and the durability of aircraft structure to survive. Fowler was not deterred. He traveled to Dayton, Ohio in July 1911 to enroll in the Wright Company School of Aviation. There he began flight training and learning all he could about aircraft technology. He also secured the sponsorship of the Cole Motor Company of Indianapolis, Indiana. The plan was to install the Cole 30-horsepower four-cylinder engine in the Wright Model B biplane, dubbing it “The Cole Flyer,” the same name as the company’s latest automobile model, and compete for the Hearst prize. On August 31, 1911, Robert G. Fowler filed his intention with the Hearst newspaper, The New York American, as the first official entrant in the transcontinental competition, but with a wrinkle. Fowler would fly from San Francisco, the city of the Hearst flagship Examiner, on a west-to-east route. Within a week Calbraith “Cal” Rodgers, a well known and experienced pilot, filed to join the race out of Sheepshead Bay, New York. Soon three lesser-known pilots joined to compete for the prize on the east-to-west route. The race was on and Hearst had the sales promotional gimmick he’d planned. Orville Wright vigorously trying to talk Fowler out of leaving from San Francisco, and instead plan the southern route out of Los Angeles. Orville candidly admitted that the Wright engine should not run for more than an hour, and he feared the Cole engine would have the same limitation. But the bigger issue would be a route over, instead of around, the Sierra Nevada mountain range at elevations higher than any flyer had tried. Fowler was adamant about leaving from his hometown, and felt the mountain updraft over the Sierra could boost him and afford him extra time to locate an emergency landing site should he have an engine failure. But as insurance, he did file “either” San Francisco or Los Angeles as a starting site. Preparation was a daunting task between readying the plane and the complex logistics of navigating the continent while maintaining contact with a support crew along the way. The only reliable west-to-east guideline would be the railroad tracks, commonly called the “iron compass” by early aviators. There would be a rail car with spare parts, mechanics, a portable machine shop, fuel and supplies, all underwritten by the sponsoring Cole Motor Company. 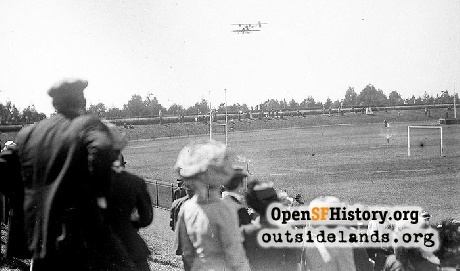 The take-off site would be the Stadium in Golden Gate Park, better known today at the Polo Fields. Fowler had hoped to depart on Sunday, when crowds would be largest, but planning delays pushed the departure to the following day, Monday, September 11, 1911. The Examiner generously estimated there were ten thousand spectators at the stadium to see the historic event. Also present was Fowler’s father and mother, and mayoral candidate James Rolph with his campaign staff. Rolph produced a bottle and a brief ceremony was held to christen the Cole Flyer by splashing Pacific Ocean water on the airplane. A Rolph campaign button was pinned on Fowler’s sweater coat, and the photographer snapped mom giving her son a send-off kiss. The New York Times the next day would report that a suffragette had pushed through the crowd, kissed the embarrassed flyer and placed a button calling for “Votes for Woman” on him, but it was just his adoring mother and Rolph’s campaign button they were describing. All the preparation and preliminary ceremonies had pushed a scheduled 10:00 a.m. departure to 1:35 p.m. before Fowler crossed the stadium infield, became airborne, made a wide circle over the crowd, and headed north across the Richmond District. He then headed east across the bay and northeast for his first stop in Sacramento. The scheduled Sacramento stop entailed a ceremonial meeting with Governor Hiram W. Johnson, and not getting airborne again until 5:55 p.m. Fowler’s overly ambitious plan was to make it over Donner Summit and land in Reno by 5:00 p.m. on the first day. Despite making great time, aided by the winds east of Sacramento—he averaged over 60 MPH—the flyer only got as far as Auburn, California before darkness descended. The next day Fowler got impatient waiting for the weather report from the summit and took off without it. Gale-force winds and mechanical troubles forced him to crash land in trees east of Colfax, seriously damaging the Wright Model B.
Bruised, but not seriously injured, Fowler connected up with his support crew and they began rebuilding the wrecked plane. Reports to the press minimized the damage, and gave encouraging estimates of how soon the aviator would be off to conquer the continent. Robert Fowler would spend ten days on repairs and another eight vainly trying to coax his four-cylinder engine to lift the light plane over the summit in the face of high winds and downdrafts. On the morning of September 29, 1911, Fowler and his crew awoke to find the Cole Flyer with a light covering of snow, and finally accepted that they had to get out of the mountains they couldn’t get over. Nineteen days into the thirty allotted for the Hearst prize, there was not enough time left to cross the continent, even if no mechanical problems were encountered. But Fowler was driven by the challenge, more than the prize, and spent the day sending telegrams and making arrangements for a new start from Los Angeles. 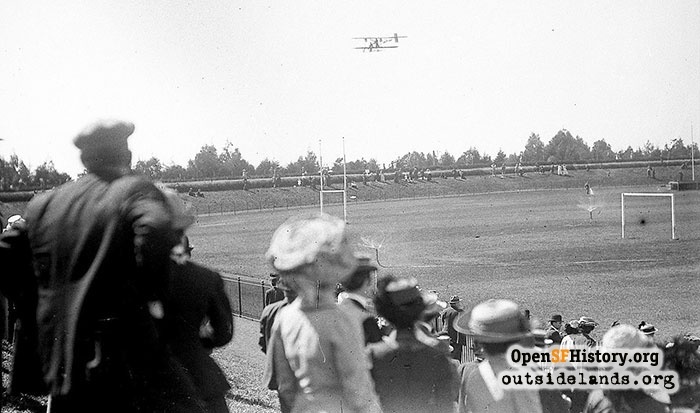 Fowler next took off from near the Los Angeles Country Club on October 19, 1911. On the southern route, Fowler would encounter different obstacles, like getting lost in the fog over Pasadena, and running low on water in the desert. The route along the “iron compass” was maintained, so Fowler could both communicate with the press that was following his adventure and have supplies and mechanical support as needed. The obstacle that nearly scuttled this flight route was encountered in the desert of eastern New Mexico, when he landed in sand and couldn’t get traction to take off. The first remedy tried was securing tarps brought from El Paso, Texas, and staked down over the sand, but still the skids and bicycle-wheels-landing-gear stuck. Fowler then ordered lumber to be brought from El Paso to build a 100-foot plank runway. That, too, failed. Frustrated, but not ready to quit, Fowler came up with an ingenious scheme. His crew took a railroad pump car, removed the upper pumping component, and assembled a platform for the Flyer with a release mechanism for the pilot. The idea was to use the motor of the plane to power down the track on this jerry-rigged takeoff vehicle, and for Fowler to release when he thought he had enough speed to become airborne. The adventure became more harrowing as a freight train approached, but Fowler’s scheme worked, and he became the first aviator to take off from railroad tracks. 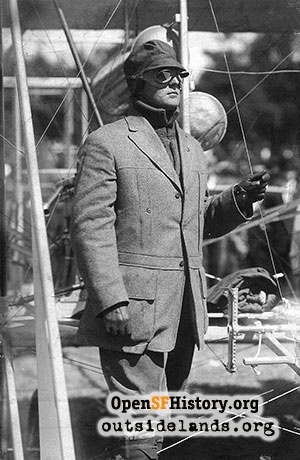 Robert Fowler spent the rest of 1912 taking advantage of his aviation notoriety by participating in air shows and county fairs across the country. In late November he was back in San Francisco to participate in a show at Ingleside race track. Out at Ocean Beach he did his morning practicing with his friend from San Jose, Roy Francis, testing a new Gage plane he acquired in October. Fowler knew the perils of getting stuck in sand, and used the hard-packed road near the Life Saving Station for takeoff and landing. He stayed in the area and participated in the four-day San Francisco International Aviation Meet at Tanforan track in San Bruno that opened on Christmas Day. Fowler flew the Gage with an 80 horsepower engine, setting a Northern California altitude record of 9,100 feet (which very likely would have brought him over the Donner Summit fifteen months earlier). 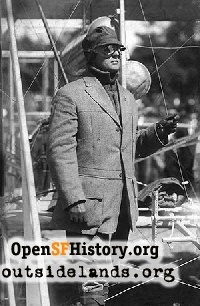 He participated in the groundbreaking celebration for the Panama Pacific International Exposition on January 1, 1913, making demonstration flights with fellow local birdmen. Fowler’s next major challenge was to become the first to complete a non-stop ocean-to-ocean flight across the Isthmus of Panama in April. As he had done in Texas, he brought along Ray Duhem, a San Francisco cameraman, to take still photos for an article in Sunset Magazine and motion pictures for showing in theaters. Because the pictures taken from the air showed the U.S. Army fortifications, Fowler and Duhem were arrested and charged with violating a federal statute prohibiting distribution of pictures of fortifications to anyone but the War Department. The case had great public sympathy and a San Francisco Grand Jury finally dismissed it. During the 1915 PPIE, Fowler ran a “Flying Boat” passenger concession in competition with the Loughead brothers, and was on the investigation committee that reviewed the cause of the fatal Lincoln Beachey crash. In 1917, Fowler had a Signal Corps contract to build airplanes during the war as Fowler Airplane Corporation in a factory on 12th Street near Howard in San Francisco. The factory burned down in May of 1918, and Fowler briefly reestablished his air charter business. He was on the move a lot in his auto-racing and airplane events years. He did not leave a consistent residential trail to follow in public records. However, he did live at least for a time in the neighborhood he dramatically soared over on his famous departure from the Polo Fields. On September 9, 1918, when 34-year-old Robert George Fowler registered for the World War I draft, he gave his address as 25 Cabrillo Street, and two years later, he shows up in the city directory living at 109 16th Avenue in the Richmond District. Primary resource for researching this article was The Life and Times of Robert G. Fowler by Maria Schell Burden (Los Angeles: Borden Publishing, 1999). Special thanks are extended to Jack Hudson and Frank Sternad. Page launched 1 December 2016.